First you need to make a pattern for the felt to fit around the barrette. There will be 2 pieces when you finish this. 1. First make your pattern to cover the barrette. Place the barrette on top on top of a piece of paper and trace around it, adding 1/4 in. around the outside as you trace. Cut your pattern out. Now repeat with the pattern, but cut off the last 3/4 in. of the pattern so when they are stacked on top of each other, one pattern piece is shorter then the other. 2. Now that you have your 2 pattern pieces, place them on your wool felt and either trace and cut out or just hold the pattern on the felt and cut. 3. With the smaller piece of wool felt, you are going to snip a small line in the back and slide the back of the barrette into it so that the wool is now "attached" to the back of the barrette. 4. Place the other piece of felt on the top side of the barrette and close the barrette. Now is when I use my sewing machine and I slowly sew the pieces of felt around the barrette. If you don't have a sewing machine, or would rather, just sew it up by hand. 1.The buttons (either use some buttons from your stash, or if you have a button maker you can use your fabric to make a button to color-coordinate with the fabric/wool felt. 2. 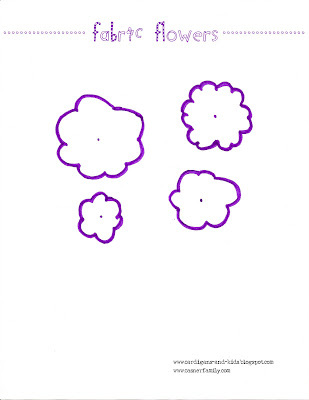 Using the pattern below, or making your own, cut out the felt into the flower shape. If you want you can cut more then one size and stack them. You can also use fabric. 3. Sew the button (with the thread doubled up-so both sides knotted together at the base) in the center which will keep them together when you sew them to the felt covered barrette. I cut my thread long enough that I can complete this step and the next one with the same thread. 4. Now sew the flower to the felt on the barrette, making sure that it is pretty snug so it will last longer. 5. Cut the threads and wear. -IF you would rather make the barrettes with all fabric in no felt? To make sure it is sturdy, I cut at least 5 flowers (4 the same size and the 5th a bit smaller to go on top directly below the button). I would fold a few of the layers so they look fuller. 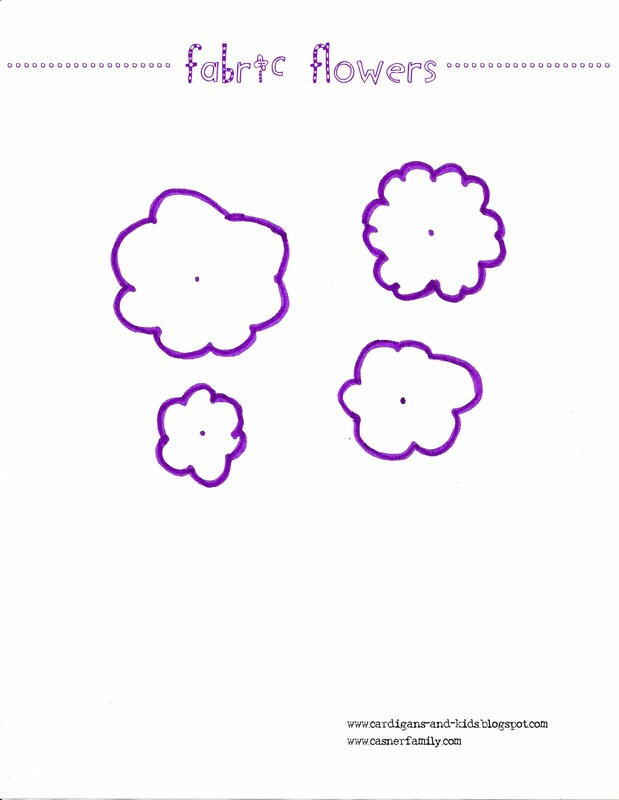 Here are some examples of the flowers I drew and cut out. They are about 2in. wide. If I have left some details out and you have questions-please email me.